It is a truth universally acknowledged that a young professional in London in possession of some disposable cash, must be in want of a good brunch. Those in this position will no doubt be familiar with populist brunch recommendations such as..
“The Breakfast Club is great, as long as you don’t go at breakfast time. Or on the weekends. Or in Soho. But actually I can’t be bothered going all the way to Angel or Hoxton or Camden or Battersea Rise anyway so let’s just queue up and hope for the best. 10am is early enough, right?” (Wrong). And then there’s Caravan at King’s Cross. It suffers from some of the same hype (we’ve waited over 45 minutes in the past for a table for brunch!) and I’ve paid more than my wallet was really prepared for on more than one occasion. But. They do these poached eggs. These eggs. How can I explain them? Luckily I needn’t, because the head chef only went and put the recipe online. After some adjustments for realism (where am I going to get soutzouki from at 9 in the morning? ), taste and flair, yours truly gave it a try when my very best friend came to visit for the weekend and boy was it a (healthier than a Full English) treat and extremely easy. 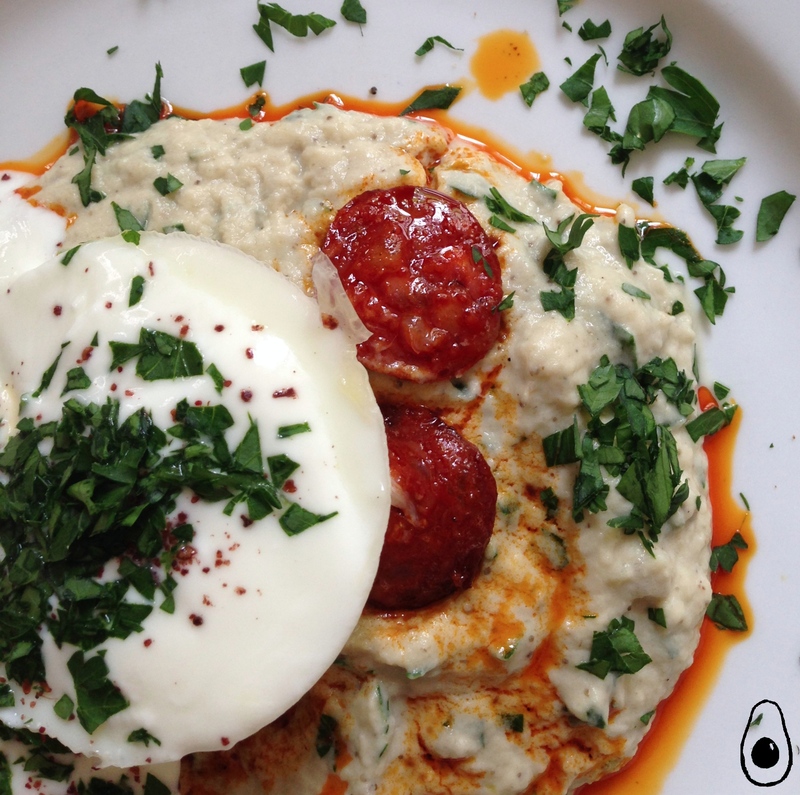 Omit the chorizo or use your favourite breakfast meat substitute for a vegetarian dish. CB adores it with streaky bacon as well, if you want to make it more of a fry up with a twist. I was happy to find that I could use some of the sumac that we had bought specially for our delicious Lamb Shawarma recipe. Next stop is to figure out what the chuff to do with the star anise before Christmas…! Serves 3, easily flexes for more/fewer guests. Take the garlic cloves, skin on, and place them on a square of foil big enough to wrap around the cloves entirely. Douse them with olive oil and close the packet up. Place the aubergines, whole, and the garlic package onto a bigger sheet of foil and then into a roasting tray – remember to prick the aubergines so they don’t explode in the oven! Cover the aubergine in more olive oil (don’t over do it – a nice thin film should do the trick) and place in your oven at 160 degrees to 180 degrees, depending on the time you have. This should take 30 to 40 minutes. Check the garlic after 20 minutes so it doesn’t dry out. It should be soft and going golden. The aubergine should look shrivelled and a little charred. In the meantime, dry fry your chorizo on as low a heat as possible. It’s extremely oily and doesn’t need any further help in this regard and cooking them low and slow helps to crisp them up. When the roasted aubergine and garlic are cooked, cut them open and scoop all the flesh into a bowl – discard the skins. The flesh should be very soft. Add the lemon juice and rind, tahini, seasoning, 3/4 of the chopped parsley, 2 tbsp of the natural yoghurt and the 1 1/2 tbsp of oil. Mix this thoroughly. I took a hand blender and pulsed this to a very smooth purée but please keep it as chunky as you like. Taste and adjust any of the seasoning. I petitioned for more lemon but was outvoted. Now poach the eggs using your preferred method. It’s my personal opinion that a hard poached egg is a crime against cooking but that’s just me. Don’t beat yourself up (geddit?) over perfecting a whirlpool & vinegar poaching method. I dropped my eggs into these with some salt and pepper and placed these in nearly boiling water then brought them to a full boil with a lid on for 4.5 to 5 minutes (have a tester egg if possible to bottom out cooking times – the ferocity of the boiling water can make a difference). Now serve – the aubergine goes first, with a flattened top to make it easier to balance the eggs. Add your crispy chorizo slices then carefully place two eggs on top of those. 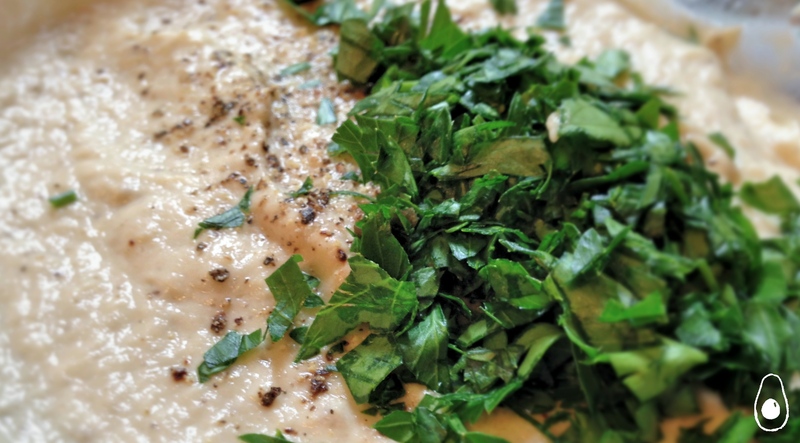 A generous dollop of yoghurt should go on top of each egg, followed by a sprinkle of sumac to taste (as a guide, no more than 3/4 tsp for all three dishes) then sprinkle further parsley on top, as fancy as you like. For decadence, I outlined the entire affair with some chorizo oil but that’s not really necessary. Serve this with your favourite toast. This tends to be sourdough at Caravan but anything seedy, brown and thick is our favourite as it holds it’s own with all that needs to be mopped up on your plate. Using big eggs will pay dividends here – lovingly pierce them both in their hearts and marvel as the yolk goes everywhere, creating a perfect toast:yolk:aubergine ratio. Eat with gusto and wash down with strong tea and orange juice. I’m submitting this post as part of Fiesta Fridays #26 co-hosted by Prudy at Butter, Basil and Breadcrumbs and Jess at Cooking Is My Sport. Thanks to Selma for the invite. I cannot over-emphasise how delicious this was. Your cheque is in the post 🙂 Thanks for playing taster, friend! Thank you! The playlists are an absolute must in my house – I can’t cook without music and it’s easier to be spontaneous/create new dishes with some themed music! Thanks for stopping by. I read this post SO carefully and closely. I am scheming to duplicate it AS SOON AS REASONABLY POSSIBLY. It looks so absolutely amazing, I don’t even have words! But actually, this is going to be a priority to make soooon. Thanks for sharing and welcome to the party! Wow, does this ever look fantastic! So happy to have found your site! Thank you Angie! It’s Mandi, most of the time – I leave the vegetable related pet names for out of hours 🙂 Thanks for stopping by – I absolutely love this recipe and will be trying many variations over the coming months! And I’m glad you like the playlist – it’s almost my favourite part of creating the posts! Can’t wait for future FFs…! Wow! I love this creative egg dish! I am always looking for something fun and creative to do with my eggs! Happy Happy Fiesta Friday!! Wow. I have to say that this might not make it to the table. And if it does, I’m putting a big tablecloth over the table (so that nobody can see me), and putting the dish underneath….. and then I’m going to climb under the table with a fork and spoon (maybe a napkin) and keep it all to myself. I mean, I don’t mean to sound selfish or anything, but this is absolutely amazing! I’m so impressed with this. Thank you so much for sharing this with all of us…. and ok. It can go on the table…but only small portions for everyone, so that I can have one great big portion! I’m so making this.. awesome…awesome post. ❤ So very nice to meet you! Great looking eggs! A great looking breakfast/brunch.. anytime dish! NIce to meet you at FF! This looks like one awesome breakfast! Thank you and you too!! Great writing and story telling! I’ve saved the recipe too as it looks fantastic. Can I say I completely agree with the need for soft poached eggs? Nothing more disappointing than piercing an egg and getting….nothing. Welcome to Fiesta Friday! How mouth-watering gorgeous! Simply divine! Hah! Love the need to count out the chorizzo! So true in so many households. Yum! Looks much better than being crammed in for brunch out! This is a GLORIOUS breakfast! This is my dream breakfast! But also lunch and dinner…. I lived in Kings X for 2 years and never tried Caravans. I tried Breakfast Club instead. It is great but, as you said, you need to queue a long, too long. Beautiful pics! Thank you! The queue really does my head in but the food is pretty tasted, granted. Check Caravan out if you ever get a chance! Patty, I have to tell you, they were delicious – and very easy to do 🙂 thanks for stopping by! They are amazing! Let me know if you try them !